EXTREMELY RARE AUTOMATIC S281 SALEEN MUSTANG. LOW PRODUCTION #31 FOR 208. OF THE 394 TOTAL PRODUCED IN 2008, 207 COUPES WERE PRODUCED WITH ONLY A HANDFUL BEING OFFERED IN AUTOMATIC. 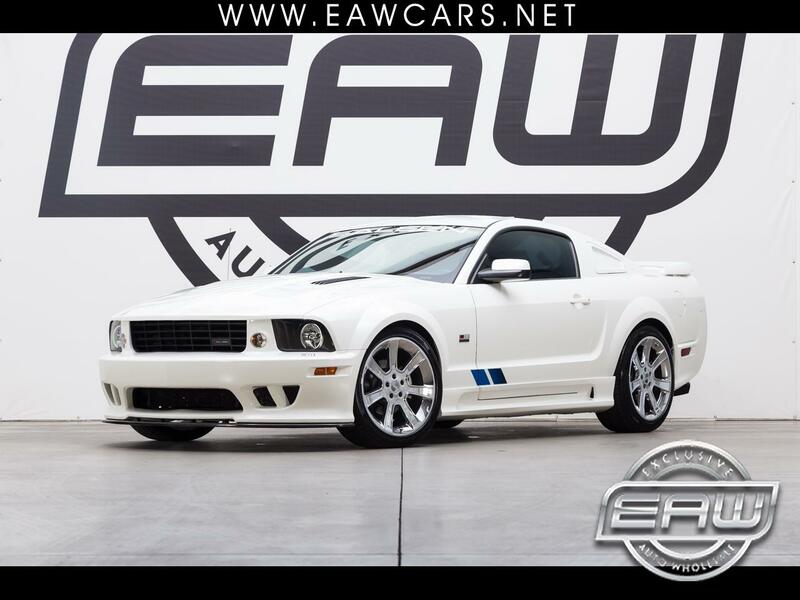 THIS SALEEN WAS ORDERED AS A NATURALLY ASPIRATED S281 COUPE IN PERFORMANCE WHITE WITH BLUE GRAPHICS AND CHROME WHEELS. THE PREVIOUS OWNER UPGRADED THIS COUPE WITH GENUINE SALEEN PARTS TO BRING IT UP TO SUPERCHARGED SPECS. THE SALEEN SERIES VI TWIN SCREW SUPERCHARGER WAS ADDED BRINGING THE OUTPUT UP TO NEARLY 500 HP, ALL WHILE RUNNING A VERY CONSERVATIVE 5-6LBS OF BOOST. INCLUDED IN THE SUPERCHARGER KIT WERE LARGER INJECTORS AS WELL AS A CUSTOM ECU CALIBRATION FROM SALEEN. TO MAKE ROOM FOR THE SUPERCHARGER, A SALEEN S/C HEAT EXTRACTOR HOOD WAS INSTALLED FOR BOTH FUNCTION AND FORM. BORROWING FROM THE SALEEN S281 EXTREME PLATFORM, A CARBON FIBER FRONT SPLITTER AND REAR DIFFUSER, ALONG WITH THE SOLID QUARTER WINDOW TREATMENT COMPLETES THE TRANSFORMATION OF THIS ONE OF A KIND SALEEN. ALL OF THE SALEEN BADGING IS IN PLACE WITH MATCHING NUMBERS INCLUDING THE DASH PLAQUE, UNDER HOOD PLAQUE, SALEEN TIRE PRESSURE STICKER, SALEEN MODIFICATION DOT STICKER DATED 1/08 AS WELL AS MATCHING ECU STICKER IN THE GLOVE BOX WITH MATCHING 1/08 DATE STAMP. CAR IS AN ABSOLUTE BLAST TO DRIVE AND A REAL HEAD TURNER. RARE CHANCE TO OWN A PIECE OF AUTOMOTIVE HISTORY.